Bug the Forager comes to Scott Free begging him to help them in their betrayal of Orion the Highfather of New Genesis. So many of his kind have been killed in the war against Apocalypse that they want to follow a new leader who will protect them. Scott Free decides ton confront his half-brother but before he can do anything, he is beaten savagely by Orion. 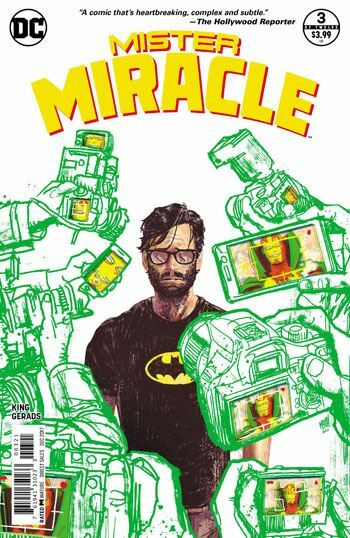 What is the future of Mister Miracle? The lateness of my review may make it appear that I do not care about this comic. I do. It is possibly one of the best series of 2017. 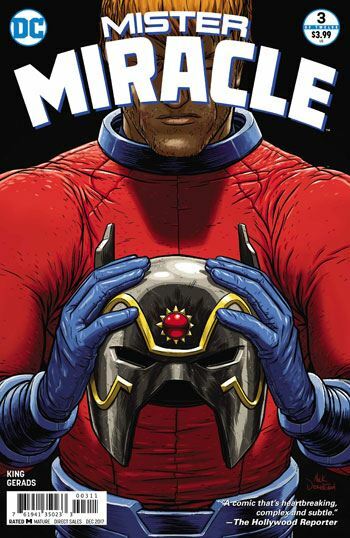 However, I had duties to attend from which I could only escape now, much like Scott Free, Mister Miracle. Much like him, I confront my duties in various parts of my life. In his case, he would rather be a world-renown escape artist and entertainer rather than a general in an alien war between gods. However, unlike Mister Miracle, when I sacrifice my duties at ComicBookBin for my life as a researcher, I do not get beat up by anyone like Orion. Orion here is in fact the son of Darkseid and the irony of this imposter on the throne waging war much like his real dad and beating up the real heir of New Genesis is fun to see unravel. Tom King made me dislike Lightray very much. This is good. He never had much of a personality anyway. I like this one. Mitch Gerads continues to delight with the nine-panel grid which is best kind of composition for comics with repetitions and high levels of storytelling. It is as suitable for moment-to-moment sequences as action-to-action shots. Gerads makes use of this layout as much as possible to tell a story heavy with words. Yet the quiet frames reveal as much as those with words. Some sequences, however are not as strong. For example, the page where Mister Miracle climbs the crane would have been better told had Gerads used a vertical nine panel grid system, or simply three panels read from the bottom up. It is true that most readers would have started from the top but the page would have been more elegant. Such pages show the limits of the nine-panel grid. Breaking it into a three-panel vertical grid would have been better. It makes me worry that the nine-panel grid is being fetishized instead of used as an effective storytelling tool.